It is a rare occurrence that I repeat recipes within a month. I have an ever-growing list of recipes and ideas, so I'm more likely to try and tackle something new than I am to repeat something we've had recently. So it says a lot that I've made Ina's Baked Shrimp Scampi twice within the last month. The first time, I made it on January 31. The day before February's Barefoot Bloggers recipes were announced. So I sat tight on my picture, and was ready to post on February 25th. And then... I forgot. I don't know what came over me, but I just forgot to post! I guess since I had been sitting on it for so long, it slipped my mind. So anyway, here we are now. This is one of the easiest recipes to throw together. I probably spent less than 10 minutes prepping, then the scampi baked for another 10 minutes or so. The white wine-butter sauce is rich and flavorful, with a nice burst of flavor from the lemon zest, rosemary, and garlic. And the panko crust gives that nice crunchy texture. Such a simple dish, but it couldn't be any more perfect. I suggest serving this over fresh pasta with some good bread. Thank you to Jill of Insanely Good Food for choosing this Insanely good recipe! Butterfly the shrimp by cutting along the outer curve of each shrimp, and opening like a book. Do not cut all the way through, just deep enough to help them stand up. Place the shrimp in a large mixing bowl and toss with the olive oil, white wine, 2 teaspoons salt, and 1 teaspoon of pepper. Set aside while you prepare the butter mixture. In a small bowl, mash together the butter with the remaining ingredients, through the panko. Add 1/2 teaspoon salt and 1/4 teaspoon of pepper and mix to thoroughly combine. Starting from the outside of a gratin dish or pie plate, arrange the shrimp in a single layer, cut side down, curling the tails toward the center of the dish. Pour the remaining marinade over the shrimp. 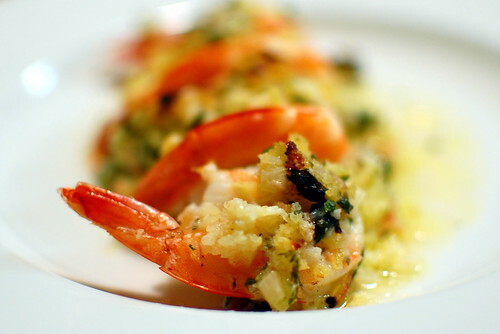 Drop the butter mixture over the top by the spoonful, and bake 10-12 minutes, or until shrimp are cooked through. Place under the broiler for 1-2 minutes to brown the top, and serve with lemon wedges. i feel the same way about this recipe! I love making it and it always comes out delicious! This is delicious! I did not go to the bother of standing the shrimp on their edges. I used slightly smaller shrimp and had plenty for 8 people. Definitely will make this again!